There is nothing so wonderful as the feeling you get from spending time gardening when the sun is shining. Ok, this weekend the sun was focused on Sunday, but at least it was dry all weekend. After you have done the work, you get a warm feeling from looking at the improvements you have made in the garden. Today, it was still light enough that when I had finished everything I had to do, I was able to rest for a few minutes and soak up all that I had achieved. All my roses are now pruned. In the past, I have struggled with the two roses over the pergola. It is nice to have different climbers flowering at different times, but the downside is that not all of them should be pruned at the same time. The buds on my clematis armandii are full and soon it will burst into flower, but that means I have to be really careful where it is intertwined with the roses. I love pruning as it brings order out of chaos. One example of this is the climbing rose that I train along the fence. First, I remove the shoots that were along the fence last year and then, I choose the longest new growth to bring down to cover the fence panel. 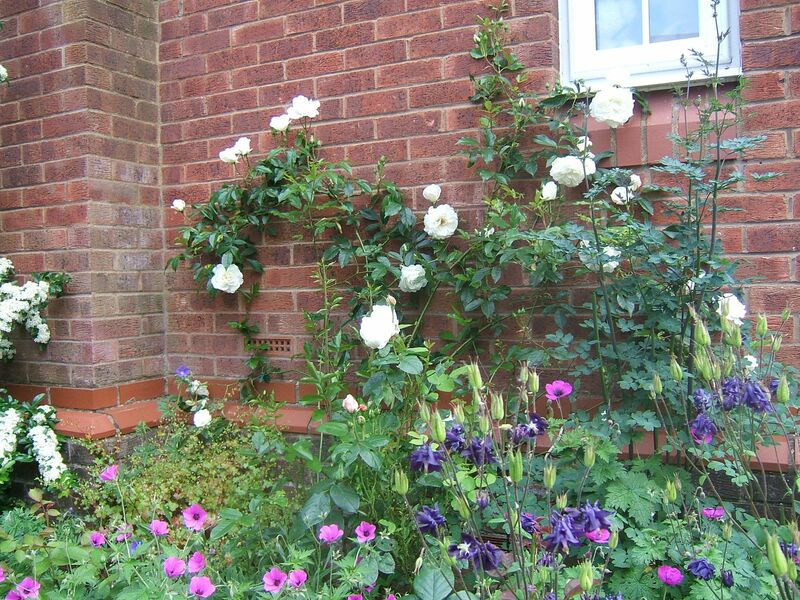 This is a really good way to train climbing roses as not only are the flowers closer to one’s eye line, but also the horizontal stems produce more growth and therefore flowers. I have staples placed approptiately on the fence posts and tie the stems to them with plastic twine. I usually use green garden twine, but prefer the plastic for this job as it seems to have more “give” as the plant grows. 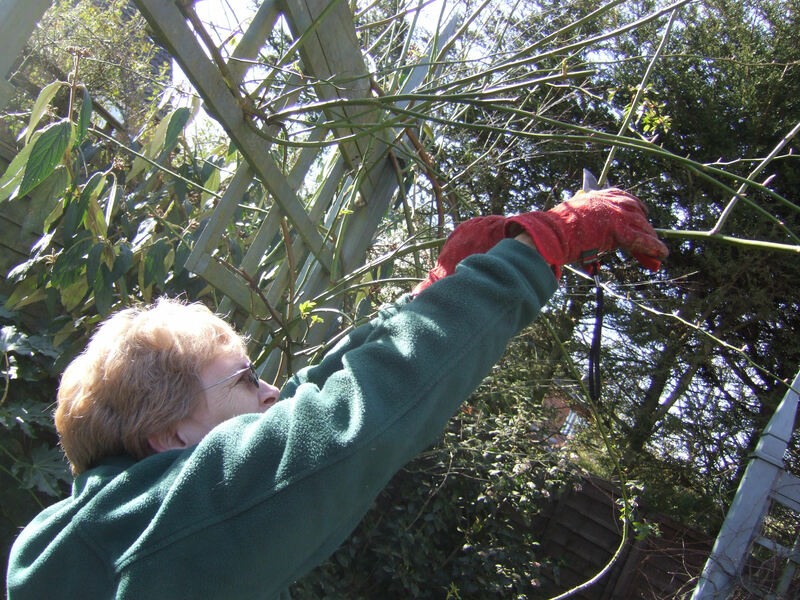 The last job is to prune out the stems that aren’t long enough to be useful. Next, I moved onto my shrubs. I want to keep them at a size that is suitable for my garden and so I have decided that the best height for them is what I can reach standing on my step ladder. I can reach most of what I need to with my telescopic loppers, but for the shoots at the back of the shrub, I have to get out my very long tree pruner that I usually use for the wisteria. I decided to leave the bay for a while since I has seen a blackbird building her nest in it, so the last shrub to be pruned this weekend was the dogwood. I obviously left a few stems on last year that I shouldn’t have as some of them were rather too large for my loppers. But, eventually I managed to prune them all out. Then for the last job of the day, the shredding. I was a little concerned that I had too much to fit into my garden waste bags. Certainly without the shredder, I would have had to make a few trips to the tip, but it handled it all and now I just have to wait until Wednesday when they are emptied. All in all, a lovely weekend in the garden and a warm feeling about what I had accomplished, but best of all was the serotonin boost. It was a beautiful day today, so at lunchtime I decided to get started on my spring pruning. Thirty minutes later, three clematis and a climbing rose and been pruned and I had had a lovely dose of sunshine :). 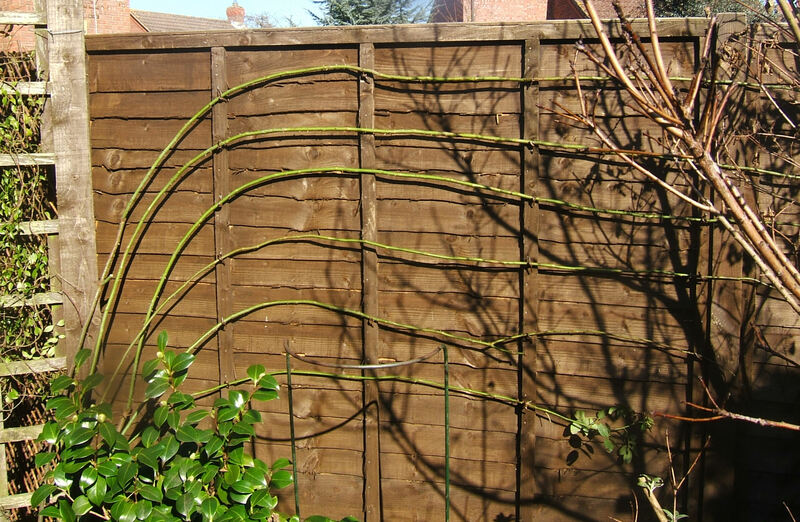 It is always hard to cut back the clematis since it seems wrong to remove all those green shoots higher up the plant. But this is the way to produce the strongest plant and the most buds for this year – so I do it. Now that the working day is over and with it the sun has dropped below the roofs of the surrounding houses, it is now time to go out back to the garage and put the trimmings through the shredder, one job that can be done with the help of electric light. I know that I have trained the dogs to stay outside the garage, but it never ceases to amaze me that they do so, without any command what so ever. They stood there tonight on the threshold, knowing they shouldn’t cross it – them in the dark and me in the light. Only another three weeks to go before the hour changes :).